Both public and private organizations acknowledge that managing the PC life cycle becomes more complicated and expensive as the variety of PC devices and employee workstyles increase. In order to be fully productive, different groups of employees have different needs in terms of end-user device hardware, software, and configuration. 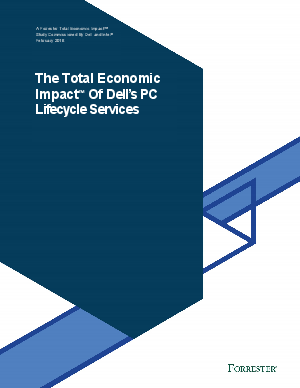 Dell and Intel® commissioned Forrester Consulting to conduct a Total Economic Impact™ (TEI) study and examine the potential return on investment (ROI) enterprises may realize by leveraging Intel® Core™ vPro processors and Dell’s ProDeploy Plus and ProSupport Plus services.